Here is what we do know ( going by the pictures below ). It was made in Monroe, Lousiana. 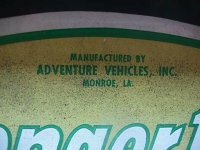 By Adventure Vehicles, Inc. It is Belt driven, Has a dump bed, And a electric start engine. The three wheeler you show on this page.. http://www.3wheelerworld.com/oldsite/Avenger.shtml is indeed by Adventure Vehicles. I used to be a dealer for Adventure Vehicles. 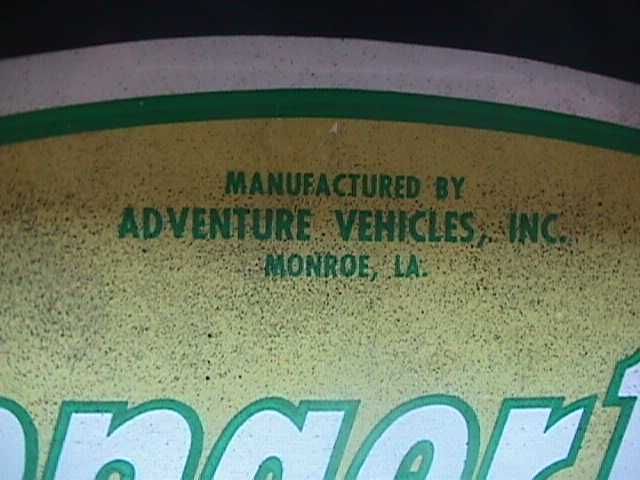 The model shown has the same drive train as the rest of the Adventure Vehicles line. It has a Kohler 8 hp 318 cc engine. It uses a Comet centrifugal clutch and torque converter. It also has a Comet transaxel with forward, reverse and neutral. 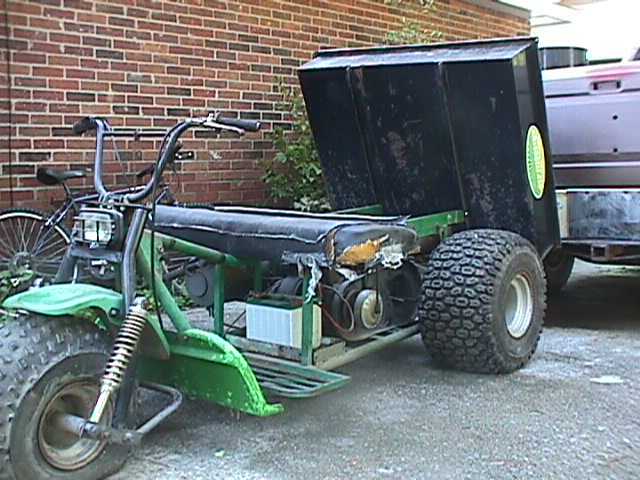 It rides on Turf Tamer tires and was available with a fixed rear axle or a differential. The 1/4 T has a max speed of about 20-25 mph. The other models had a higher gear ratio in the transaxel and would do 35 mph. 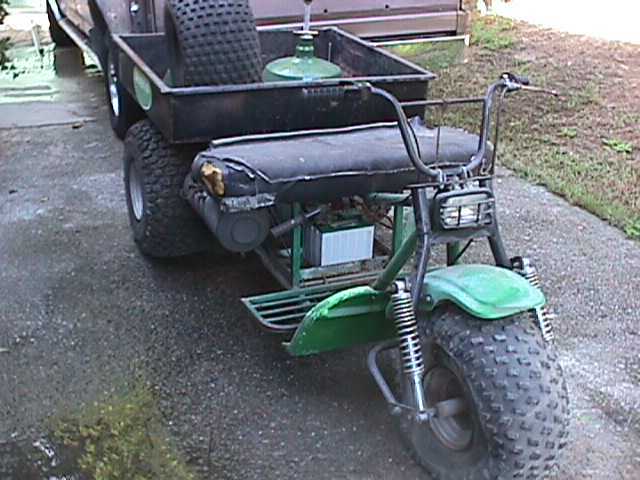 Adventure Vehicles was the first manufacturer of quad ATV's. They started making a three wheeler and offered a quad front end for Honda three wheelers.They added the Avenger 400 quad soon after. Honda noticed their quad and came out with the Suzuki Quad. Honda built a test track in Monroe, LA and started factory design and testing for a full size Honda model. The rest is history. 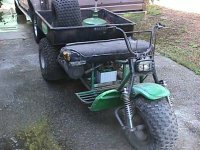 Just like when Honda destroyed the US minibike industry in the early 1970's with the Honda MiniTrail, Honda's put Adventure Vehicles out of the manufacturing of ATV with their Quads. 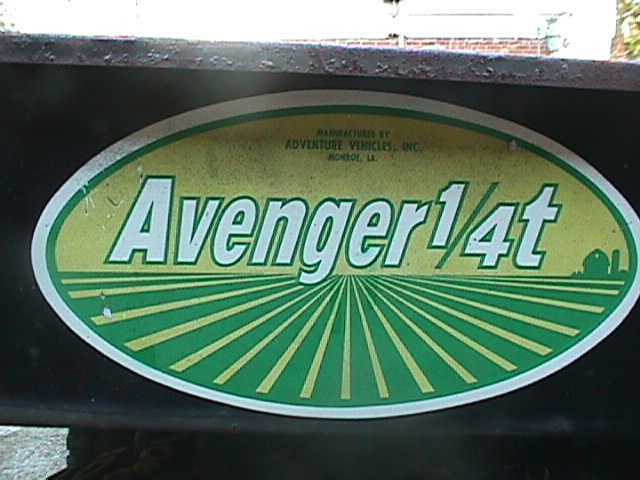 Their Avenger 400 was a ride on top ATV with ridgid suspension. Although it was a very stable vehicle, it had lousy steering geometry and was a fight on rough trails. With its wide track and ridgid suspension, I could race it around my asphalt parking lot and power slide the corners. I still have one that I rebuilt the front end on for better steering geometry. One of the original markets was the agriculture industry. 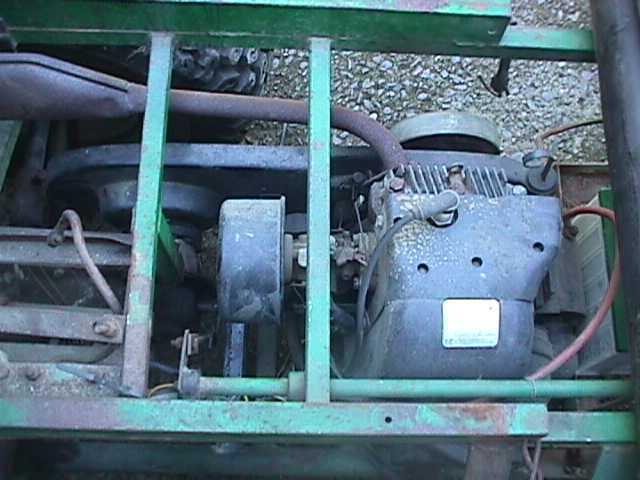 The forced air cooling made it a better vehicle for a farmer. The Honda 3 wheeler had a tendency to overheat if left idling while parked. I asked Mark if it would be ok to post his email address if anyone else had some questions about the Adventure vehicles and said it was ok. His e-mail address is MarkGMID"at"cableone,net. (Replace the "at" with an @, and the comma with a period for it to work). If you have any other information on this Beast let us know so we can add it here.